Match Day 4: Sandhausen? Aren’t they in the third league? “Saturday 1 p.m. 1. FC Köln – Sandhausen followed by football” (thank you Ragnar for helping me get the joke! Man, people sure can get snarky around here when the three-pointers aren’t coming! Of course, I too would feel better with something other than an ellipse in the “W” column on the line headed “1. FC Köln.” More to the point, it seems like the number found there should be a crooked number, too. I have no problem saying we left two behind in Dresden and are so much better than Paderborn that we should have taken a victory there, as well. Obviously, there are many good reasons why the Billy Goats have just the three points total for the three matches played this season, many of which are the same reasons people are a little on edge heading into what is as close to a must-win scenario as you can get in the fourth match day of a 34-match campaign. SV Sandhausen arrives at Mungersdorf a team that started preparing for third-league competition even before their second-league debut had been completed. Weeks before the 2012-13 season drew to a close, SV Sandhausen had secured relegation and was looking forward to the opportunity to do some reorganizing in the third league in hopes of returning to the second league in relatively short order, but better prepared for it, having experienced its demands first-hand. While Sandhausen retains several of the players who managed a 1:1 in Köln last August, Regis Dorn, the man who scissor-kicked the 89th minute fun-killer last season for Sandhausen, has moved from player to “team manager” for SV Sandhausen. Likewise, the man who headed the ball perfectly to Dorn, Kevin Pezzoni, will not be on the pitch when the ball gets rolling tomorrow in Köln. He’s Aue’s problem now. Timo Horn is Timo Horn. He may be young, but he established himself last year as being among the best keepers in the 2. Bundesliga. He’s also proven himself to be among Germany’s top talents, having caught the eye of DFB coach Horst Hrubesch who inserted Horn in this week’s match with France, providing Horn his debut with the U21 team. Though Schwartz has a keeper who managed a clean sheet in his club debut on match day against Aalen and surrendered only one the following week in Aue, Marco Knaller is likely to be on the bench tomorrow as Manuel Riemann is considered the normal number one, despite surrendering two goals last weekend in Sandhausen’s draw with Cottbus. Riemann, you may recall, stopped two penalties against 1. FC Nürnberg in Sandhausen’s to lift Sandhausen to a first-round victory over Der Club. As Vfl Osnabrück’s top keeper last season, Riemann managed 18 clean sheets in 31 matches, conceding only 21 goals total on the season. While Riemann’s third-league credentials are impressive, they don’t quite rise to the level of what Horn has done since becoming 1. FC Köln’s number one last summer. Last year, Holger Stanislawski put Christian Eichner, Kevin Wimmer, Dominic Maroh, and Miso Brecko on defense in the home match with Sandhausen. While Wimmer is available, he’s unlikely to play, and Eichner is still seeking employment since being set free this past off-season. Brecko has been, by far, Köln’s most-reliable back. Jonas Hector has yet to show the form at left back that made him among the hottest names in the squad last year, but remains the best option on that side. Bruno Nascimento and Roman Golobart seem to be auditioning for the center back spot alongside Maroh in replacing the injured Kevin McKenna. Golobart got the nod the first two weeks due to Nascimento’s absence to attend to family matters in Brazil. While Stöger seems to prefer Nascimento’s style of play to that of Golobart, Nascimento found himself often a step behind Paderborn players last week as they streaked into the offensive zone. This lack of consistency in the one spot may be causing some instability in the other, as Maroh has also struggled to show last year’s form. Like Köln, Sandhausen has three-quarters of their primary back line intact from last season. Timo Achenbach, Daniel Pischorn, and Julian Schauerte all return from last year’s squad, giving the visitor’s defense at least some consistency. Whether that consistency is worth much more than that is doubtful, as Sandhausen’s 66 goals conceded was the league’s worst. The new face in the group is center back Tim Kister, who moved from VfR Aalen on a free transfer over the summer. Kister appeared in 28 matches for the leagues seventh-stingiest defense. Though the Effzeh defense has showed some flaws in the early going while adapting to the new system of play under Peter Stöger, the end result has yet to be multiple goals surrendered. We know the players are capable of better overall play than what they’ve shown, and are fully capable of completely closing the paths to the goal. Sandhausen held Aalen scoreless, but as they’ve scored only twice so far this season, that’s not too telling. Likewise, surrendering two to Cottbus isn’t too revealing, considering they had scored four the week before against Paderborn and were blanked by Düssseldorf. It’s difficult to gauge this one, as we’ve no idea who Stöger will select, though indications are we will see the Effzeh in a 4-4-2 formation when the match starts. Going with that, you have to wonder whether Stöger will use Maurice Exslager in the midfield after his short but impressive entry in the Paderborn match. Without question, his insertion brought the Köln attack to life in ways it had not been all day. Does a 4-4-2, though, allow for Marcel Risse, Daniel Halfar, AND Exslager all at the same time? That is a fairly offensive-minded group. With an opponent that struggles in attack…maybe? One has to believe Adam Matuschyk will be the fourth midfielder. He didn’t have his best game in Paderborn, but the list of Effzeh players about whom that could be said is fairly long. Assuming the need for at least one defensive-minded midfielder in the group, it’s either Matu or Matze Lehmann. If Stöger wants to launch a more-aggressive offensive-minded attack, the advantage goes to Matu. Lehmann would seem an option only in the case of packing it in defensively and counter-attacking, which I simply cannot believe will be the approach when three points is a must. Sandhausen has been utilizing the ultra-popular 4-2-3-1 and is unlikely to try anything different here. Stefan Kulovits and Matthias Zimmermann have been the holding midfielders in all three matches so far, as well as the cup victory. Kulovits will be familiar to Stöger, as the former Rapid Wien man appeared in four matches against Austria Wien last season, with Stöger’s side outscoring Kulovits’ 9 to 3 on aggregate. Zimmerman was last seen in the Bundesliga with Greuther Fürth, on loan for the second half of the season from the Ponies of Mönchengladbach. In case you don’t know how Fürth fared last season, I’ll just sum it up by saying there is a good reason they’re back in the second league. The remaining midfielders are likely to include Nico Klotz, who missed most of last season due to lingering injuries, and Marvin Knoll, a free transfer from Hertha BSC. Klotz has started all four of Sandhausen’s matches this year, while Knoll failed to start only the opener against Aalen. The fourth midfielder has been been a rotating cast, though David Ulm’s return from injury may have Schwartz settling on the Frenchman to round out his midfield rotation. Sandhausen has had a bit more consistency than Köln at midfield, though the superior talent, of course, belongs to the home side. Additionally, Schwartz has gotten enthusiastic play from his midfield troupe, which seems to be the quality lacking in the Köln midfield for most of the season so far, forcing Stöger to continually tinker with formation, strategy, and line-ups. While there is no doubt that, by the next meeting of these two clubs, the Köln midfield will have settled into a solid unit, right this minute, I think Sandhausen, even if only for the sheer effort their group gives, earns the edge in this comparison. Anthony Ujah. There isn’t much more to say about it. He may lack some technical skill, but he has proven that, at least in the 2. Bundesliga, he scores goals. Now, with a second striker joining him up front in a 4-4-2, could Ujah become even more dangerous, as opponents may need to also find a way to deal with Kacper Przybylko? If Pritsche plays like he did after entering the Paderborn match late in the day, defenses will have some decisions to make, because the young Polish national was a breath of fresh air and showed he deserves more playing time. Ready to work together again? Sandhausen is still hoping to land another attacking option before the transfer window closes. Last year’s top scorer for the club, Frank Löning, has come on as a late substitute in the last two matches for Schwartz, with Ranisav Jovanovic, a free transfer from MSV Duisburg, serving as the lone striker in Sandhausen’s cup win and the draw with Cottbus. This one isn’t even close. Löning (31) and Jovanovic (32) may have some veteran savvy available to their game, but neither would be a threat to the playing time of any of the Effzeh attackers, should any of them magically appear in the visitor’s locker room. All the dangerous weapons will be on the side of the home team. Peter Stöger has yet to taste either victory or defeat in a 2. Bundesliga match, though he did get a win in the opening round of the DFB Cup. Alois Schwartz took his first league loss in match day 2 and similarly awaits his first league win, which is unlikely to be near as sweet as having knocked Nürnberg out of the Pokal. Stöger, however, is coming off a championship season in the Austrian Bundesliga, whereas Schwartz spent last year in the third league with Rot-Weiß Erfurt in a mid-table class-retention season. Championships beat third-league struggles any day. While both teams are seeking their first win, the Effzeh seems to have the confidence appropriate of a giant club inviting a victim into its lair for an abusive visit, whereas coming into the situation saying that it’s possible to get points in Köln, might lead one to believe Sandhausen is going to do everything they can to steal one point, at best. 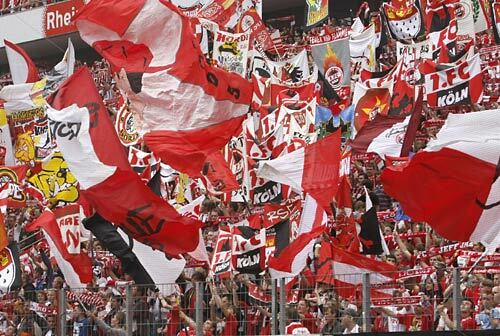 The home-field advantage given by the Effzeh fans is a given, even though the match has yet to sell-out. Sandhausen doesn’t travel well, even to their own stadium, so there won’t be much of a boost offered to the visitors there. All the circumstances swirling around this game are a bit of a perfect storm. Sandhausen certainly could weather what’s coming and steal a point, but the much more likely outcome is that the storm lands and does a lot of damage, relieving the pressure that’s been building into dark clouds. When it’s done, the air will smell fresher and the sun will come out. There will be Kölsch. There you have it. I’ve scientifically shown why the Effzeh must and will have a big victory Saturday afternoon. Of course, if all these matches were decided on paper/my keyboard, we’d be preparing for, say, Schalke 04 or FC Augusburg tomorrow, rather than Sandhausen, not to mention having some attention being paid to potential Champions League group mates. Rather, someone who need sleep to keep up with two kids to avoid going further into the crazy than he already is. Be the first to comment on "Match Day 4: Sandhausen? Aren’t they in the third league?" The 2015 Karneval Jersey: So Ugly, that it’s Beautiful!